Picture of Sherman County Courthouse from 1922. Veteran's plaque on the Lodge Hall. Plaque on building shows it was built in 1947. 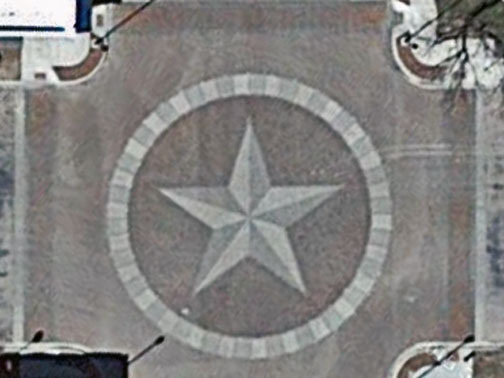 Aerial view (from Google maps) of the star in the middle of the street. Couldn't get a good picture at ground level. Nothing to stand on! Entrance to cemetery where we did a nice loop. Sherman County Veteran's Memorial in the cemetery. Old Atchison Topeka & Santa Fe Railroad Depot. The small matching building to the right is a switchman’s shanty. An old Phillips gas station from the 1920s . Nice House with interesting inset windows in second floor. Fight over which town would have the courthouse.